exceptional service to the association. John was an active AFIO member and volunteer, a "doer," a vital part of that essential core of volunteers and staff that form AFIO "engine" that keeps the association moving and the mission accomplished. He will be sorely missed, by us, by his students, and by many across the land. He was a 1960 graduate of the Air Force Academy, flew missions in Vietnam, was allowed a couple of years to get his Ph.D. prior to a teaching assignment at the Academy and served tours as the Commandant of the DIA Defense Intelligence College and as professor at the National War College. After his military career John continued to make contributions to the study and teaching of intelligence. He helped to build a network of university professors teaching the intelligence-related courses, and greatly enhanced curriculum development and teaching materials . His greatest contribution to AFIO was as the co-editor of AFIO's flagship, the "Intelligencer." But this listing just barely hints at the essence of the man -- he was bright, forthright, creative, positive, cooperative, helpful, liked and respected, and the list could go on. We will miss him. John died on November 24th after a long and courageous struggle with cancer. 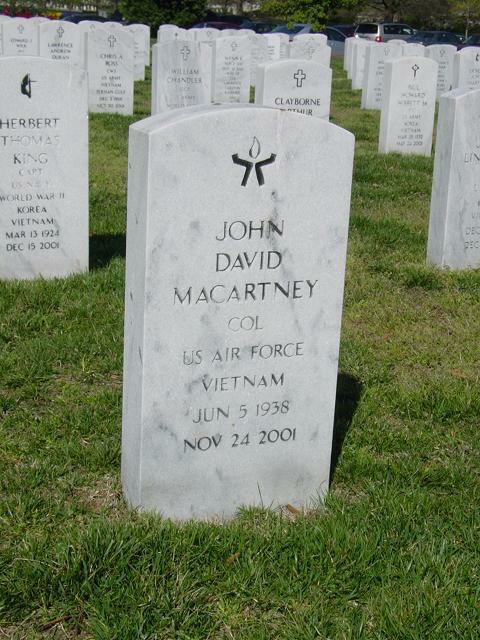 Funeral and memorial services will be held at 1 pm at a Fort Myer Chapel 11 January 2002. More detailed information will be provided when available. John's widow, Lorna Albright, asked that, in lieu of flowers, donations be made to AFIO to help fund an AFIO Academic Scholarship which we will establish in John's name. Rest in peace, old friend. (Jonkers).